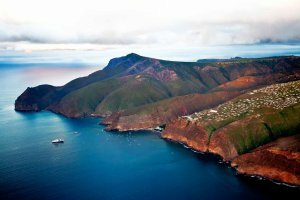 Saint Helena is a volcanic tropical island in the South Atlantic Ocean, 4,000 kilometres east of Rio de Janeiro and 1,950 kilometres west of the Cunene River, which marks the border between Namibia and Angola in southwestern Africa. 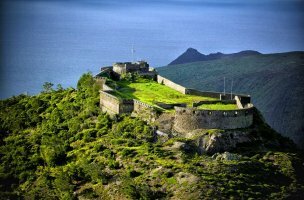 The economy of Saint Helena depends largely on financial assistance from the United Kingdom. The country's local population earns income from fishing, the raising of livestock, and sales of handicrafts. Because there are few jobs, a large proportion of the work force has left to seek employment overseas. Despite the fact that the teritory of the country is rocky and stony, the country is well-known for its food and agricultural produces export. Saint Helena produces and exports a unique coffee bean, grown from plants that directly descend from the original seeds brought to the island from Yemen in 1733. The country produces the following fruits for export: bananas, papaya, pineapples, mangoes, watermelons, cantaloupes, passion-fruit, breadfruit, coconuts, avocados, and citrus (including mandarin oranges, grapefruit, lemons and limes). Exported vegetables include: sweet potatoes, carrots, sweet corn, tomatoes, taro, yams, peas and beans. The top export destinations of Saint Helena are the United States, Yemen, Japan, South Africa and Australia. Until 1966, Saint Helena had a monocrop economy based on the cultivation and processing of New Zealand flax for rope and string. Saint Helena's economy is now very weak, and the island is almost entirely sustained by aid from London. There are no minerals and most of the land is unsuitable for farming, except on a small scale. $14.434 million of imports were made in 1995, imported commodities including: food, beverages, tobacco and tobacco substitutes, fuel oils, animal feed and many others. The country focuses on creating strong logistic infrastructure o its territory. The deficit of roads influences badly local economy as well as its position on international market. In such a way, the country is obliged to import construction materials and engineering as well as machinery and mechanical appliances. The government of the country plans to open a big airport on the territory of the island in order to connect with all the world’s corners. In such a way, the country has to import aerospace and defense products as well as aircraft equipment. The country imports small boats, such as canoes and kayaks and rigid inflatable boats in order to transport different products from one part of the country into another one as well as to connect with the neighbor countries and develop the fishing industry. The top import origins are South Africa, the United Kingdom, Greece, Canada and Italy. 8. Provide technical advice and assistance in standards and quality control matters. - building materials - rate of duty 5%. Persons wishing to import goods are required to attach six copies of this invoice to the application for an import license and/or the intent to import. A pro-forma invoice may also be required when presenting an application to Saint Helena authorities to ship bonded goods through the country. - Animals unless accompanied by a permit issued by the Chief Agricultural & Natural Resources Officer, St Helena.